The innovative solution for wireless data transmission. TRANSMITTER For Measuring Instruments MFI Order No. 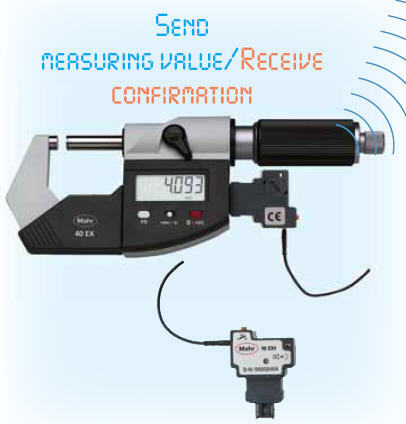 The transmission of the measured value occurs via the actuation of the data send button on the transmitter. The transmitter supplements a measured value with an address number, a communication control word and a double check sum. The special data coding and the feedback from the PC ensures absolute data security. If a transmission error is recognized by the dialog between the PC and transmitter, the data transmission is then repeated two to three times automatically within a few milliseconds. Increase safety on shop floor by elimnating cables, "rat's nest phenomena"
Visual and audible confirmation coupled with our patented error recognition feature that will re-send data transmission automatically ensures error free functionality. Various types of transmitters are offered to provide wireless RF transmitters are offered to provide wireless RF transmission for a wide variety of Mahr Federal prodcuts. Slim Key software comes complimentary with the purchase of an FM1-USB receiver. Sim Key management software enables full control of up to eight FM1-USB receivers and associated inputs (120 inputs per reciever). 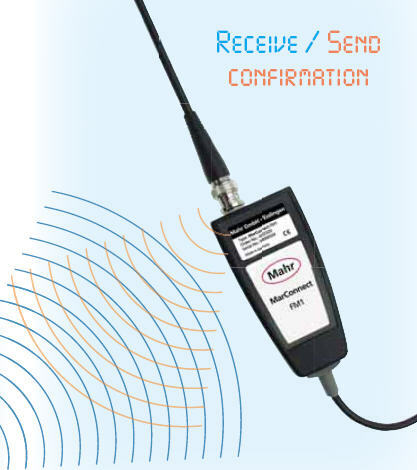 Sim Key keeps track of every transmitter's specific RF signature and assigns a frequency address so that incoming data transmissions do not get lost.